Innovation expert Clayton Christensen says outstanding companies can do everything right and still lose their market leadership—or worse, disappear altogether. Focusing on “disruptive technology,” Christensen shows why most companies miss out on new waves of innovation. In all types of businesses, successful companies with established products will get pushed aside unless managers know when to let go of traditional business practices. 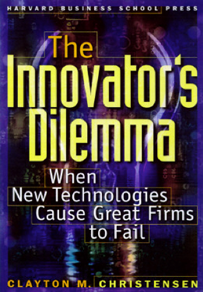 Using the lessons of successes and failures from leading companies, “The Innovator’s Dilemma” presents a set of rules for capitalizing on the phenomenon of disruptive innovation. Christensen explains: When it is right not to listen to customers; when to invest in developing lower-performance products that promise lower margins and; when to pursue small markets at the expense of seemingly larger and more lucrative ones. “The Innovator’s Dilemma” will help managers see the changes that may be coming their way and will show them how to respond in order to succeed. Engineer and social scientist Andrew Hargadon contends that our romantic notions about innovation as invention are actually undermining our ability to pursue breakthrough innovations. Hargadon argues that breakthroughs are the result of occupying a unique position in a networked landscape across which ideas, people, and objects from past technologies travel and are creatively recombined in new ways that spark new technological revolutions. Inventors “borrow” existing ideas from an arena, and then bring together the physical artifacts and the people necessary to apply those ideas elsewhere. 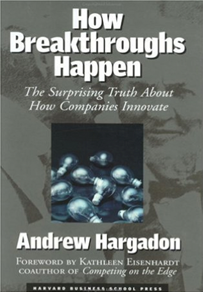 This process, which Hargadon calls “technology brokering, ” has been the force behind numerous celebrated inventions. “How Breakthroughs Happen” takes readers behind the scenes—from Edison’s Menlo Park lab to IDEO—to illustrate strategies for sourcing, nurturing, and exploiting ideas in new ways for new markets. No other book synthesizes the entire history and evolution of strategic management in the way that “Strategy Safari” does. In a colorful, jargon-free and straightforward guide, top strategy authors Mintzberg, Ahlstrand & Lampel clearly set out and critique each of the ten major schools of strategic management thinking to facilitate intelligent, informed strategy formation. In the process, “Strategy Safari” makes sense of a field where enormous amounts of confusion exist. 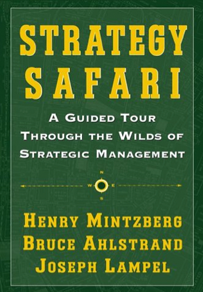 “Strategy Safari” is a wonderful primer on business strategy – interesting and insightful. Michael Treacy uncovers how great companies master growth each year and how all businesses can identify and exploit opportunities for increased revenues, gross margins, and profits. Treacy’s main point is simple—it is possible to grow any business by 10 percent or more, year after year, in good times and bad. 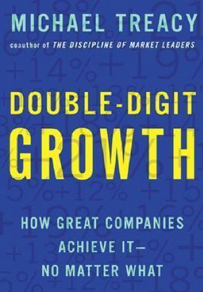 He addresses the challenge of double-digit growth with five disciplines of growth: (1) keep the growth you have already earned, (2) take business from your competitors, (2) show up where growth is going to happen, (4) invade adjacent markets, and (5) invest in new lines of business. Treacy supports his argument with case studies of well-known and little-known companies that have achieved growth year after year based on this diversified approach. Treacy’s makes a compelling argument that sustainable, double-digit growth is a realistic and attainable business goal for any business. Since the end of the Cold War, the United States Army has been reengineered and downsized more thoroughly than any other business. In the early 1990s, General Sullivan, army chief of staff, and Colonel Harper, his key strategic planner, took the post-Cold War army into the Information Age. Faced with a 40 percent reduction in staff and funding, they focused on new peacetime missions, dismantled a cumbersome bureaucracy, reinvented procedures, and set the guidelines for achieving a vast array of new goals. 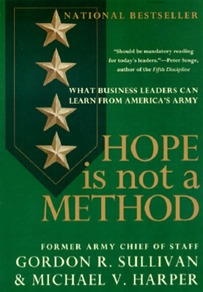 “Hope Is Not a Method” explains how this process took place and shows how the Army’s experiences are relevant to businesses. From how to stay on top of long-range issues to how to maintain a productive work force during times of change, it offers invaluable lessons in leadership and provides proven tactics any business can implement. Michael Porter’s “Competitive Strategy” should be a starting point for managers wanting to maximize profitability within a competitive marketplace. The “five forces” model of corporate competition presented in “Competitive Strategy” provides an intuitive and thorough way to analyze the attractiveness of any existing industry. With step-by-step tools to help managers select new industries to enter, forecast how industries evolve, and recognize “market signals” from competitors, Porter breaks down the three generic competitive factors — cost, differentiation and focus — that are vital for helping managers conduct industry and competitor analysis. 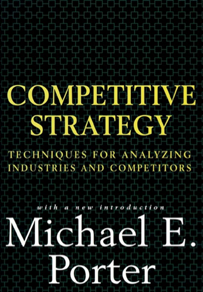 “Competitive Strategy” has transformed the theory, practice, and teaching of business strategy throughout the world. It’s considered a business classic because of its focus on simple and universally applicable basics. The “Balanced Scorecard” is a framework, which translates a company’s vision and strategy into a coherent set of performance measures. The four perspectives of the scorecard—financial measures, customer knowledge, internal business processes, and learning and growth—offer a balance between short-term and long-term objectives, between outcomes desired and performance drivers of those outcomes, and between hard objective measures and softer, more subjective measures. In the first part, Kaplan and Norton provide the theoretical foundations for the Balanced Scorecard; in the second part, they describe the steps organizations must take to build their own Scorecards; and, finally, they discuss how the Balanced Scorecard can be used as a driver of change. 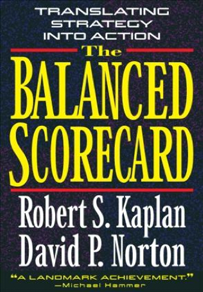 Kaplan and Norton’s pioneering “Balanced Scorecard” is important reading for those who seek to measure and manage successful business strategy. 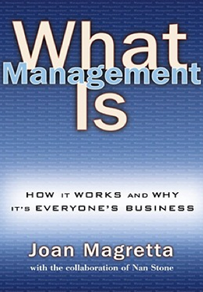 ‘What Management Is” presents the basic principles of management simply, but not simplistically. Joan Magretta, cuts through the clutter and confusion, explaining both the logic of successful organizations and how that logic is put into practice. Magretta uses examples – contemporary and historical – to bring to life management’s High Concepts: value creation, business models, competitive strategy, and organizational design. 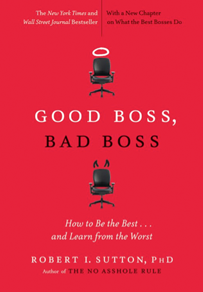 And she explains the often-unwritten rules of execution that characterize the best-performing organizations. Most management books preach a single formula, “What Management Is” examines the best that has been thought and written with a practical eye for what matters in real organizations. 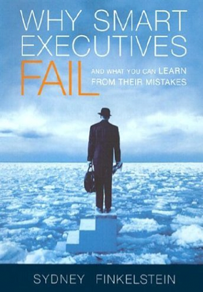 Whether you’re new to the field or a seasoned executive, this book will give you a firm grasp on what it takes to make an organization perform.